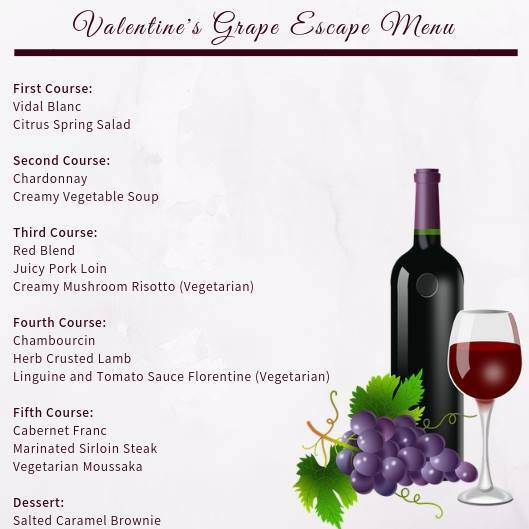 Holiday Inn in Christiansburg, VA presents the Valentine's Grape Escape Wine Pairing Dinner on Friday, February 15, 2019. Join us for a fun night of good wine paired with good food. Our Chef will prepare 5 courses, each paired with a different wine from several local New River Valley wineries. Note: Vegetarian options for each course are available. The cost is $29.00 per person and $49.00 per couple. Seating will be limited so reserve your spot today. To view the event flyer, visit: https://i.imgur.com/hMM1W55.jpg. For more information, visit: http://www.ihg.com/holidayinn/hotels/us/en/christiansburg/csbnf/hoteldetail or https://www.facebook.com/HolidayInnChristiansburgBlacksburg or call 540-381-8100.